Combining natural wood tones with screen prints and laser engraving is the simple recipe behind this new twist on tradition. By applying rich stains, we reveal the true character of the wood, giving us an earthy, natural palette. From there we apply screens that both inspire and encourage. 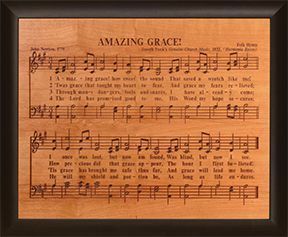 Enjoy this heirloom quality piece with inspirational verse which reads, The 4 versus of Amazing Grace are laser engraved into wood in this beautifully crafted American made piece from P Graham Dunn.